One great thing about being in AA is, like the British Queen, we get two Birthdays a year. 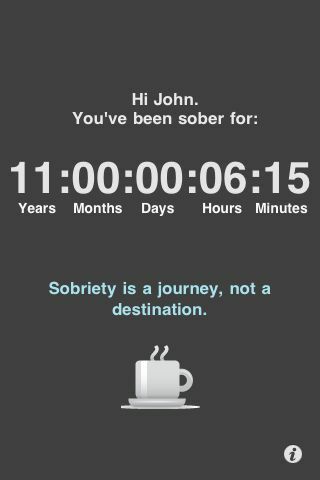 Pic is screen shot of the rather lovely “Friend of Bill” Ipod app, which I would recommend to anyone for its sobriety calculator and “Coffee Time” quick AA quotes for those small moments of quiet in a busy day. Congratulations John, 11 years awesome. I love your approach to life sober, a sense of calm surrounds you. Really sorry I missed the curry last week, allowed myself to get into a very dark place.